I really believe in activism. I am absolutely sure that protesting changes things, so bringing the baby on board was always gonna happen. But today I realised that sometimes a protest is the perfect place for the baby. Not just as there is an extra amount of people she can woo and then phones she can steal and chew. 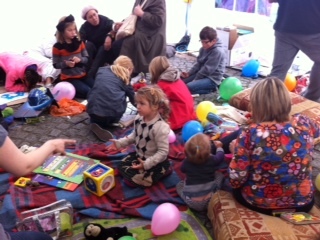 We had a wonderful time with the nippers up at St Pauls for Occupy LSX today– facepainting, parachute games, poetry, juggling, one of the dads even turned up with a bouncy castle. 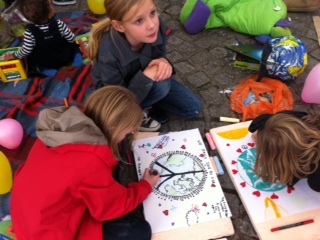 While some of the older kids reflected on and drew their ideas of utopia all around us debate, speeches and conversation took place about how we can change the utterly bankrupt society we live in right now. I’m no stranger to the shaper edge of protest. In fact (don’t tell my mum this) the first protest I took Ramona on saw us sitting down to breastfeed in a cafe just as a Black Bloc walked past- they picked up a bus stop and smashed the entire front window with it. About 3 feet away us. I have also been in peaceful, sitting down crowds as riot police have bought their truncheons down on heads. I realise it is not always balloons and bubbles. For it is here that the little ones learn that there is HOPE – that people do believe in an alternative to the economic apartheid we currently live in. Here they see true, live, democracy – people listening to each other and voting together. Here they hear the melody of diverse voices, discussing problems and solutions. But it is also the perfect place for them as it reminds us why we do it. Because they are the generation who will either inherit all this- greed (and the inequality greed gives birth to) – stretched and bloated, many time worse then we have even now, or they will inherit a much fairer and more beautiful society. It is completely up to us. Someone told me today that there are over 900 occupied cities in over 82 countries. There is an incredible global connection happening that is totally unprecedented. The Occupy movement is gathering momentum and could become enough to change things. As a friend pointed out this week, anti-apartheid protesters couldn’t envision the world beyond apartheid- all they could do was say ENOUGH, enough of this injustice. It doesn’t matter that Occupy LSX doesn’t have a list of policies, we are simply saying ENOUGH. For our children’s sake. We have had enough. 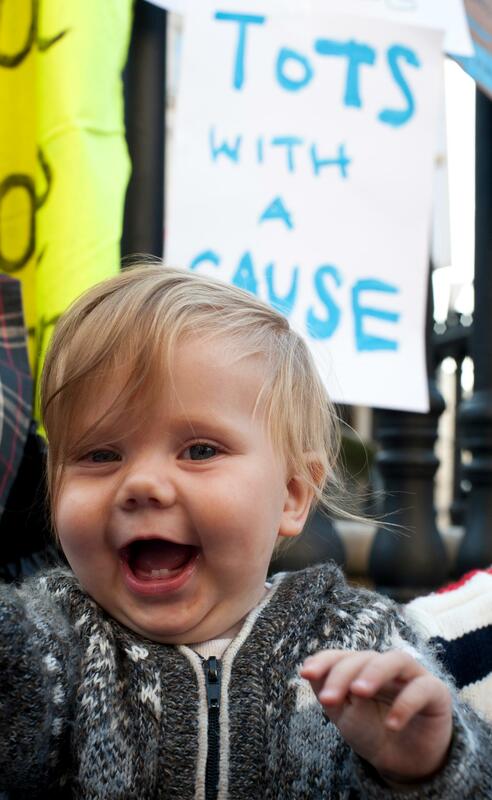 If you’ve had enough too but weren’t sure about bringing your baby along to Occupy London, please get in touch and I can introduce you to some of the coolest parent and kid activists in town. I’m sorry, all seriouspants once again. I promise my next post will be about poo. * There are safety measures you can take, I for one would almost certainly leave with my baby at the first whiff of the riot police or other violence. Posted in Activism, Parenting and tagged babies, baby, family fun, kids, london, lsx, occupy, occupylondon, occupylsx, protest. Bookmark the permalink.